Mathews, of course, was a member of the Oulipo, a group of mostly (but not exclusively) French writers famous for their advocacy of the “constraint,” a deliberate limitation imposed on a literary work through pre-established devices or formulas. Sometimes the constraints are very conspicuous, such as in Georges Perec’s A Void, which uses no word containing the letter “e,” but often they provide the work with a formal structure and don’t otherwise immediately reveal themselves, which is the case with most of Mathews’s novels (at least after he joined the Oulipo in 1972). Usually the constraint in Mathews’s fiction is a simple pattern that loosely determines form, but ultimately the pattern itself is sufficiently buried in the work’s deep structure that readers are likely not really aware that a constraint has been applied. Cigarettes (1986), probably Mathews’s most well-known novel, unfolds according to an underlying formula — A encounters B, B encounters C, etc. — but this rudimentary formal blueprint is hardly noticeable (and ultimately irrelevant) once the characters have been established and their intertwined fates have begun to play out. Cigarettes is far from a conventional novel, but the reader prepared to accept the apparent formal scheme, focusing sequentially on pairs of characters, surely finds that the formal design creates its own kind of narrative tension, even generating a kind of mystery plot, as we try to make connections among the characters and to associate images or motifs across shifts in both perspective and chronology. This sort of formal procedure, not so much a “constraint” as an enabling device allowing the work to achieve its own particular alternative to straightforward linear narrative, can be found in Mathews’s new (and unfortunately posthumous) novel, The Solitary Twin. The novel depicts a small group of people on an unnamed island (likely a Pacific island somewhere near New Zealand) that by all accounts seems idyllic, but of course conceals a secret the novel ultimately, if obliquely, reveals. The events chronicled in the novel are initiated when an independent publisher named Andreas and a psychologist named Berenice separately arrive at the island, each for their different purposes eager to meet with a pair of identical twins, John and Paul, who apparently avoid meeting or speaking with one another, even though in every way they act in the same ways and exhibit the same tastes and habits. Andreas wishes to sign the brothers to a book project that would account for their curious circumstances, while Berenice wants to study their behavior more closely. We are immediately introduced to Berenice and Andreas after they have begun a sexual affair, and their initial conversation establishes the novel’s reliance on talk, both in dialogue among the characters and in a series of stories told by the characters as a kind of challenge they set for themselves. All of Mathews’s novels, despite their superficial oddities, their digressiveness, and their unorthodox formal structures, continue to put great emphasis on story. Indeed, his fiction is finally all about story, even as its underlying conceits distort, bend, and shuffle the elements of the stories they are also responsible for generating. The novels published prior to his membership in Oulipo, The Conversions, Tlooth, and The Sinking of the Odradek Stadium, as well as many of his earlier short stories, are generally picaresque narratives that methodically extend their surrealistic premises but accentuate contingency and irresolution. The stories move from the curious to the improbable, and end without confirming that a satisfying conclusion to an inherently purposeful journey has been reached. Nevertheless, Mathews’s storytelling skills lead us through episodes and vignettes that are themselves captivating in their eccentricities if we allow the novels their own disorderly order. Cigarettes and The Journalist (1994) in effect fragment their narratives, reassembling them according to the pre-arranged structural device. This makes it necessary for the reader to become more active in perceiving the overall contours of the story, but in the process the story itself yields in importance to other sources of interest that the formal design makes more emphatic. Thus in Cigarettes our attention is focused on the relationships between the characters, both in the pairings that more or less function as chapters, as well as the additional relationships among all the characters as they are also gradually disclosed over the course of the novel. In The Journalist, we are given a very intensive immersion into the experience of one character, as recorded in a journal he has been persuaded to keep as a kind of therapy but which quickly becomes the object of his obsession. Far from relieving the journalist’s mental discord, his journal — and thus the novel — reveals it instead. We are witness to his unraveling, and along the way Mathews is able in addition to enact a deconstruction of form, as the protagonist’s psychological compulsions are mirrored in the hilarious notational maneuvers he contrives to capture his experience as minutely and precisely as possible. The Solitary Twin is also a journal of sorts, kept by Berenice, although we don’t come to realize this until near the novel’s conclusion. (Revelations of this kind are common in Mathews’s fiction: we do not know until nearly the end of Tlooth that its narrator is a woman; we don’t know the true disposition of a painting whose presence recurs throughout the novel until the very end of Cigarettes. In this way, these novels provide a version of the climactic “payoff” readers expect from traditional narratives, but in Mathews’s fiction such ostensible resolutions don’t really offer narrative closure but in fact require readers to significantly revise their previous impression of the work up to that point, to reconsider any fixed interpretations already made.) But here Berenice has used the journal to record the activities of others, specifically their speech, so that ultimately the narrator’s role is mostly to supply brief expository passages connecting the extended conversations and set-piece storytelling. As with Cigarettes and The Journalist, the story in The Solitary Twin doesn’t follow a clear narrative line — even though the sections of the journal itself proceed chronologically — but is revealed through intimation and digression. If the dramatic turmoil at the novel’s conclusion almost seems farcical in its sudden outbreak, its tone (and the tone of the novel as a whole) is nevertheless characteristic of all of Mathews’s fiction. The stories are presented by their narrators with what seems sincere confidence in their seriousness of purpose, but the manner of telling, with its methodical detours, sometimes arcane plot details, and, in the later novels, the playfully discursive plot constructions almost unavoidably imbues the stories with a kind of facetious humor, although the characters themselves are not treated as overtly comic figures. Still, Mathews’s Oulipian reliance on formalized procedures does produce a flattening-out effect, rendering the characters in many cases not so much as two-dimensional but limited in their ability to develop conventional psychological “depth,” to “leap off the page.” (Perhaps Cigarettes might count as an exception, as several of these characters do achieve considerable individual authenticity.) 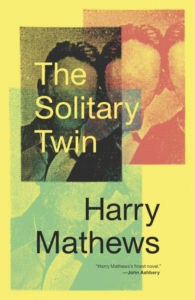 Since The Solitary Twin is partly about disguise, and a number of the characters take on multiple identities, its characters (including the narrator, who is the least involved in the novel’s overarching intrigue, and otherwise acts mostly as a narrative stenographer of sorts) even more emphatically serve not as “lifelike” characters but as the agents responsible for redeeming the novel’s formative conceit. This does not mean the characters lack interest — indeed, several of them are quite vivid in their demeanor and their way of speaking — but it does arguably does create more distance between reader and character, a distance that helps to create Mathews’s deadpan style of comedy. The conceit animating The Solitary Twin is not made plain, although likely it involves the requirement that all of the story’s salient details emerge through talk, as well as some pre-arranged order or pattern of speakers. Even so, finally what is perhaps most impressive about Mathews’s use of the strategy at work in this novel is not its way of realizing character or its alternative construction of plot, but its evocation of place, the whole small world in which the characters and their oddly crossing lives are convincingly situated. This is not done through colorful description (the narrator herself provides few such descriptions) but the gradual accumulation of apposite details, both about the physical features of the island and the habits and attitudes of the people living there. Presumably Mathews did not choose this setting arbitrarily but precisely because he could build up a portrayal of his isolated “fishing village of immemorial origin” as an arcadian paradise while at the same time beginning to disclose its less bucolic secrets, a feat he accomplishes with great subtlety and efficiency, creating a complete, credible world that is nevertheless under the author’s total control. Perhaps it could seem to some readers that Mathews is a writer exerting too much control, as he manipulates the formulas that dictate his fictional worlds. But Mathews seems to me a writer who has effectively resolved the perennial form-content conundrum. In his fiction, content — the character, the story itself — arises from the conditions imposed by the formal order he has chosen. Yet that content is almost always so engaging, the “games” the author might be playing only compel us to play along.